Outline: Little of Jesus' life. Jesus' death and resurrection. Jesus' shed blood is the only payment God will accept. We must decide about Jesus. Brothers and sisters, how can Jesus save us from our sins and make us sons and daughters of God? You have been hearing of the life of Jesus. Now I will tell you of His death. When Jesus was on earth He told His disciples, "No one has power to take My life from Me. God has given Me authority to lay down my life." While He was on this earth, He taught God's Word. He healed people's sicknesses, forgave their sins, and cast demons out of people. He showed that He was God's Son. Many people followed Jesus and listened to His words. But the religious leaders were jealous of Jesus, because He received honor from people. They hated Jesus because He pointed to their disobedience to God. Jesus could see they seemed like good people on the outside, but on the inside they were evil. They were full of greed and other bad things. So the religious leaders planned to kill Jesus. This was all according to God's plan to save men from their sins. They paid one of Jesus' followers to betray Him. They encouraged the crowd to call out for His death. [SOUND EFFECT: SEVERAL MEN CALLING OUT "KILL HIM, KILL HIM!"] The governor at His trial was named Pilate. He even said, "I find no fault with this man." But the religious leaders persuaded him to permit them to kill Jesus. This is how they did it. They took Jesus to a hill and they nailed Him to a cross (tree?). There was a thief nailed to a cross on Jesus' right hand side and another thief nailed to a cross on Jesus' left hand side. They did this in the morning. At noon time it became dark all over the earth until three o'clock (mid-afternoon). Then Jesus shouted loudly, "It is finished." Jesus died, and there was a big earthquake. The soldier guarding the crosses said, "Surely this was the Son of God." How could the Son of God die? No one could kill Him against His will. He chose to die. He was chosen by God for this purpose. He was chosen to be the sacrifice for the sin of all the world. Jesus obeyed God His Father even to death on the cross (tree?). He died a painful, horrible death. Many people mocked Him. He died and He was buried. They buried Him in a tomb made in the side of a rock. They covered the entrance of the tomb with a huge rock. But Jesus did not stay dead in the grave as all other men do. On the third day after he died, some women were coming to finish preparing His dead body. They came and saw that the stone was pushed away. 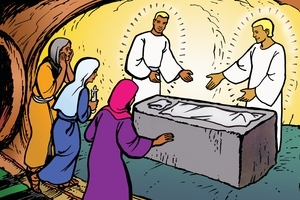 They went inside the tomb and saw a shining messenger of God. They were frightened. But the messenger said, "Don't be afraid. Jesus is alive again! You will see Him soon." Then the messenger of God left. Later the women did see Jesus. Many other people also saw Him alive again. The power of death could not hold Jesus Christ because He Himself had never sinned. Jesus Christ, the Son of God, conquered death. He broke the power of death, and He destroyed Satan's power also. Jesus paid for our sins when He died, so that we could be free. He did that because He loves us. He knew we could not pay for our sins. All our good works are not enough to make payment. Jesus shed His blood for us. That is the only payment God will accept. All other sacrifices are worthless. God will receive you if you believe and trust in Jesus. You must decide. GRN has recorded a version of this script in 437 languages and dialects. See full list.